The exhibition will be on view October 23rd-December 11th at Mindy Solomon Gallery’s new location in Little River, 8397 NE 2nd Avenue, Miami. 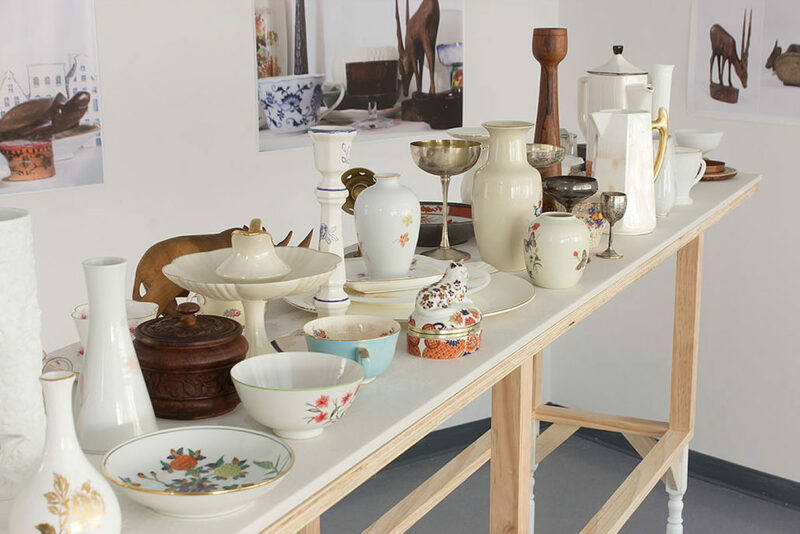 In the gallery’s Project Space, Juana Valdes exhibits her work ‘An Inherent View of the World.’ She creates a lavish, almost baroque accumulation of items which often get relegated to the discard pile when people are in the process of de-accessioning the so-called “dust collectors” of their past, decorative and sometimes utilitarian objects that might have been purchased on a family vacation or inherited from a relative and simply don’t belong in the next phase of life. “The truth beyond the fetish’s glimmering mirage is the relationship of laborer to product; it is the social account of how that object came to be. In this view every commodity, beneath the mantle of its pricetag, is a hieroglyph ripe for deciphering, a riddle whose solution lies in the story of the worker who made it and the conditions under which it was made,” writes Leah Hager Cohen in Glass, Paper, Beans: Revolutions on the Nature and Value of Ordinary Things. Discarding material possessions is never easy and each re-acqauintance with something long-forgotten prompts questions and memories. How was this once used, who made it, where did I find it, and will someone else find it again? The boxes are left at the second-hand store and reassembled without a thought of the original intent of the previous owner. It is here that Juana Valdes does her research, scouring the shelves for treasures past their prime, blowing off the dust and re-examining their value. Valdes invites the viewer to question their own object experience and the movement of material goods as a commodity, encompassing cross-cultural populations and historical transitions. the Lower East Side Print Shop, the Smack Mellon Studio Program, and the P.S.1 International Studio Residency Program. She has received support from numerous grants and fellowships including the New York Foundation for the Arts, Pollock-Krasner Foundation Grant, Joan Mitchell Grant, Cuban Artist Fund Grant and The Netherland-American Foundation. She holds an MFA in fine arts from the School of Visual Arts, her BFA in sculpture from Parsons School of Design, and attended Skowhegan School of Painting and Sculpture. She was born in Cuba and is a US citizen. Valdes is Assistant Professor of Printmaking at University of Massachusetts Amherst in the Department of Art.